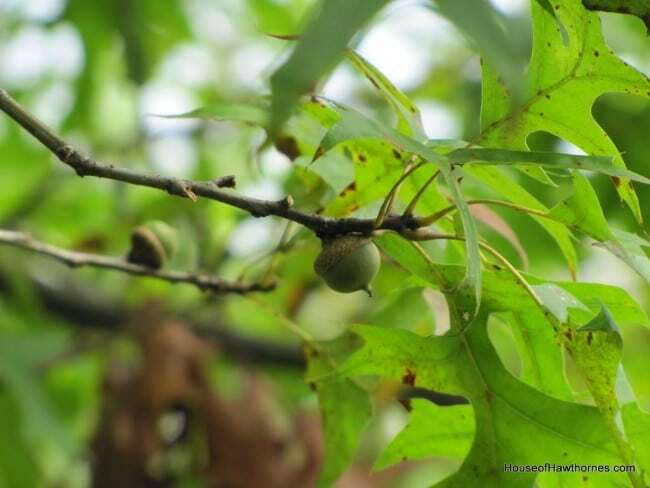 We have had quite the year for acorns on our pin oak tree. Abundant crop would not even begin to describe it. 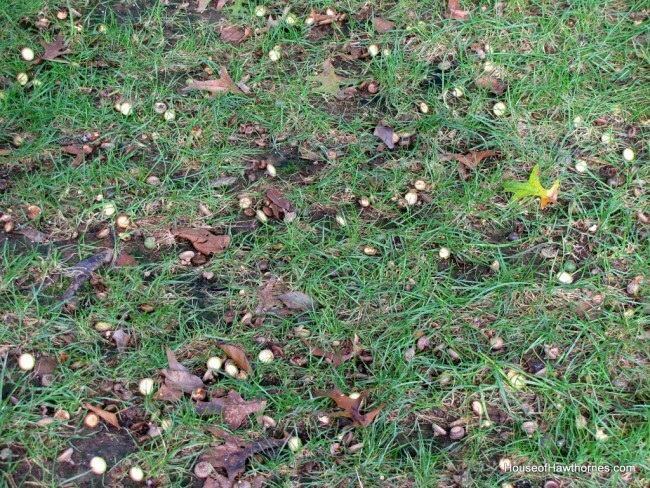 They are all over the ground and you can’t walk 4 inches without jamming an acorn into your foot. Guess wearing shoes would help with that problem. I think it is these little guys’ fault. We have about ten blue jays (blue birds??) that spend their time in the pin oak eating these acorns. Sometimes they grab them right off the branch and sometimes they throw them on the ground and dive down to pick them up. because I was going to try to do a project making felted acorns like Deena at I Make Stuff did. But then I saw that many of them still had the acorn part attached, so I went with plan B which is to dry some acorns for decoration. Sure I could just buy a bag of them at Michaels, but isn’t it more fun to do it yourself? Never in my wildest dreams would I think I would be Googling “drying acorns” at this point in my life. Where’s my rake so I can pick up more of these acorns? BTW, thought you might want to see where I really keep the acorns when I am not staging a photo of them in a silver serving dish. Yep, a dumpy old cookie sheet that has seen better days. I am drying them in the sun for a few days and then will stick them in the oven to kill off any pesky critters. To update you on the roofing situation, they are done with the exterior roofing. Except now I have a crew INSIDE MY HOUSE fixing the water spots on the ceiling. Everything on the top of my kitchen cabinets has been relocated to my dining room and everything in my living room has been lumped under tarps in the middle of the floor. All for six little old water spots, the largest of which is 6 inches long and 2 inches wide. Who knew that they had to scrape the ceiling, fix the cracks, seal the spots and then repaint the entire ceiling? In three different rooms. What happened to buying a can of Kilz spray paint and spraying them away? 15 minutes of billable work vs 2 days of billable work may be the answer. Thankfully, the insurance company is paying for this. Wonder if they will pay me a little extra money for pain, suffering and loss of blogging time though? 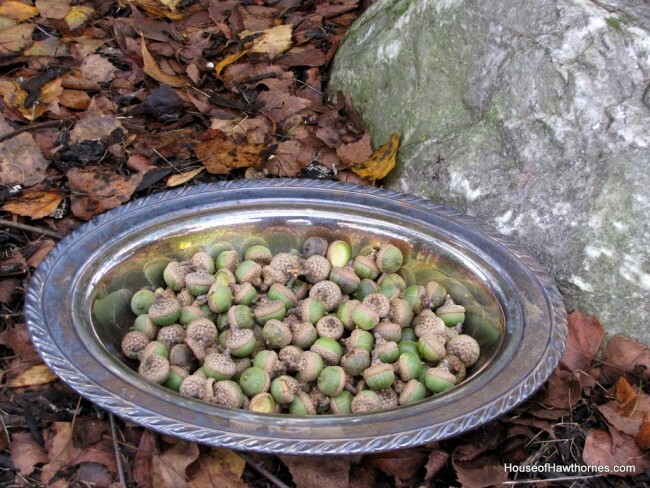 OK funny you should post this…I asked my husband why we have an abundance of acorns this year? Yours still have their hats on, so cute. I love that craft too I may have to come up with something fun with all these nuts. Pam — many years ago we lived in Minnesota and had a huge oak tree right outside our family room (with the propane tank located right under it). 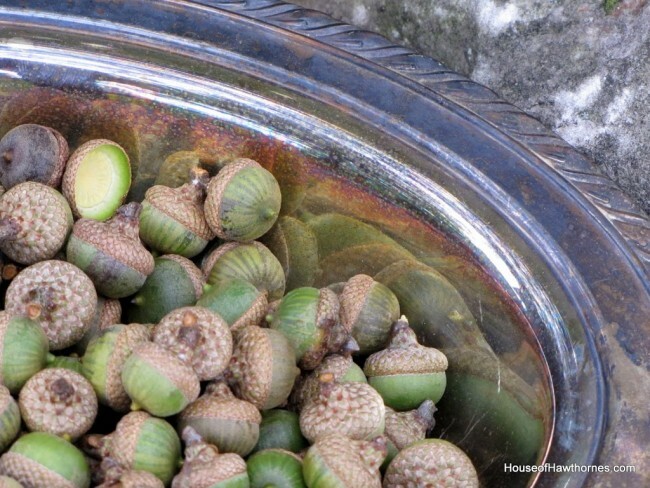 Every other year, we’d have a bumper crop of acorns (which pinged off the propane tank as they fell, lol). I think as a homeschooling family we must have read too many Little House, My Side of the Mountain and like books because we decided to make acorn pancakes. We dried, toasted and then milled the flour and made the most dreadful tasting pancakes ever, lol. The kids really tried to like them but alas gave up trying to eat them, lol. Hope the mess gets fixed in your home quickly. Oh if only I had a mess of those to gather. There would be so much glitter in their future!Enjoy. Our yard at the lake looks just like your yard…I actually brought home a bag of acorns and caps to decorate with at home, where we have no oaks! I could have brought home a truckload lol! 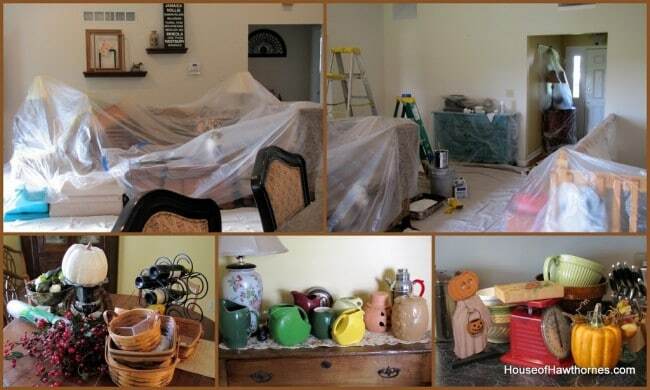 Your house repairs do not look fun…its so hard when you are right in the middle of it…hope they are done SOON! I feel for you on the remodeling…I hope the pain will be over soon!!! Can’t wait to see what you do with the acorns!!! Love the felted ones! I’m glad to know that I’m not the only that dried acorns. I have them in glass jars on my mantle along with my squirrel decor. Soon that will be replaced with Halloween items, but I’ve enjoyed my nutty decor. Best wishes with the interior home projects. I would never buy something I could get for free. 🙂 I love the idea of using them for crafts. Wow! You really did go nuts! I don’t really do crafts but each time I visit you, you inspire me to start. I can’t wait to see what you Plan B is. OMGosh! What a mess inside and out. So sorry you are having to suffer through all of this upheaval. Our walnuts were like that last year and we had a majorly bad winter…but we have very few this year and I have no idea what my poor squirrels are going to eat when there’s snow on the ground. Acorns are fun little things. I used to make little dolls and use the caps for hats. 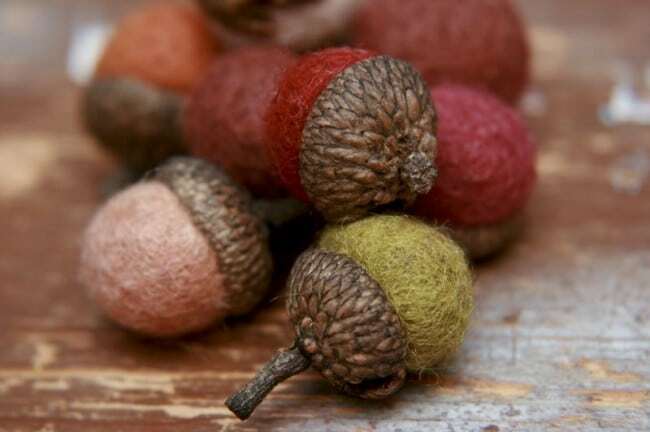 Oh I love felted acorns. I can’t wait to see yours. 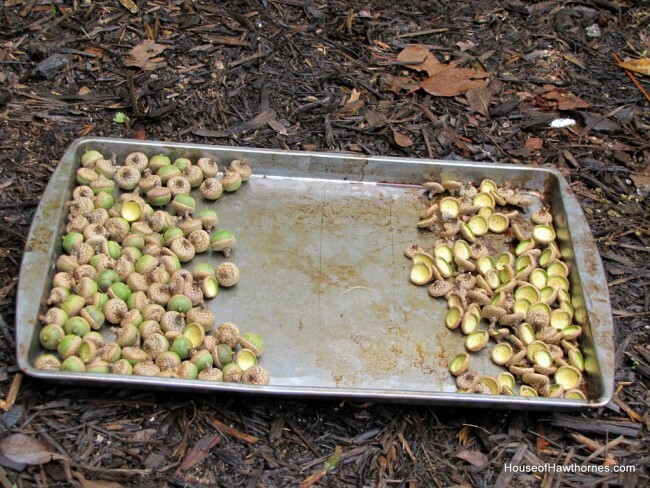 Pam, you are so lucky to have an abundance of acorns…I haven’t been able to find any in my area. When I lived in Vermont, they were everywhere…there is a huge, and I mean huge oak tree across the street from me, but nary an acorn! Dry them a LONG time in the oven … because sometimes tiny worms will emerge weeks after they enter your house if you don’t. Do not ask me how I know this…. As for the ceiling … you can’t make that omelette without breaking those eggs. Keep repeating “this too shall pass,” and it shall. And you will have beautiful pristine ceilings to gaze upon in wonder. Great photos Pam! I can relate to the roof situation. It stinks! But, it will be as good as new in no time! Hey, just in time for the Holidays. Oh, those felted acorns are cute! You should give it a try, Pam. I must have missed the part about you getting water damage…I don’t remember this. Looks not fun. Oh i used to have these trees at my old home..love the acorns! 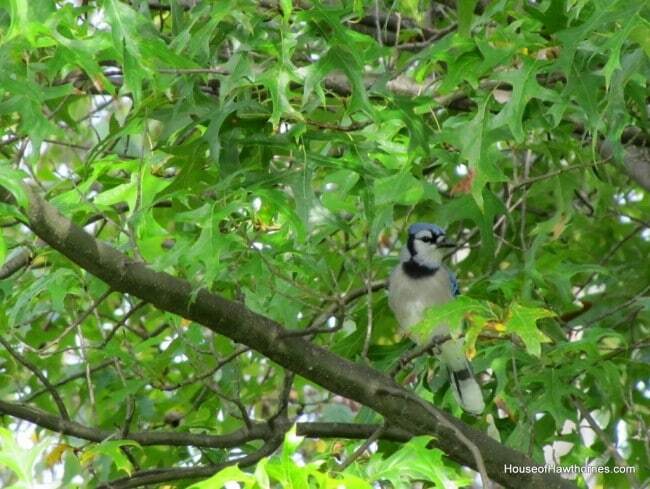 Blue Jays are such funny birds and did you know they are bullies to other birds? The acorns started falling early this year so I knew that was not a good sign. I love the felted ones, they are so cute! Good luck with the roof, I hope it gets patched up soon and you can get back to your regular routine. What a fun post! I love what you did with the acorn! They look so pretty in your silver bowl! Cute, cute! Aren’t the birds amazing to watch! We have so many squirrels hunting and gathering right now! Does that mean a cold, cold winter? I’ve been enjoying the acorns in my yard! We never had any in our other houses! 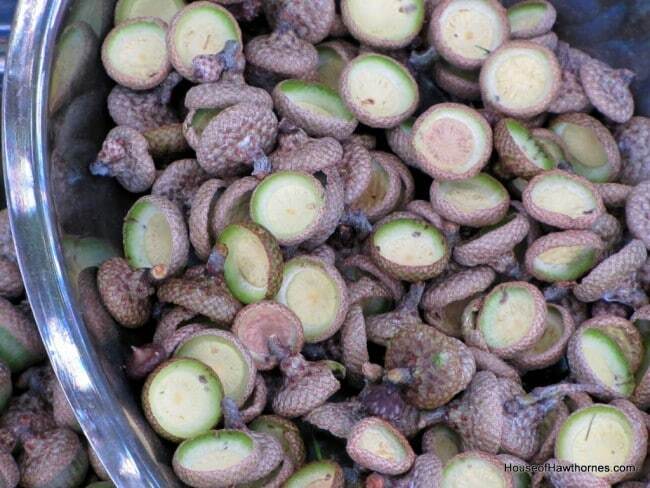 I love looking at the different varieties of acorns that people post!